Thank you for choosing your new furniture from PF Collections Ltd. 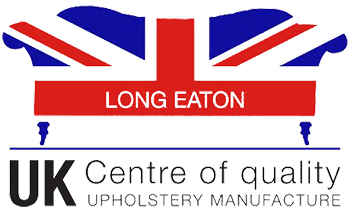 Your furniture has been hand-made in Long Eaton, an area with a worldwide reputation for producing some of the finest upholstered furniture money can buy and built to the highest standards. With the correct care, it will provide you with many years of comfort. Please take a few minutes to study this guide to help you keep it looking in the best possible condition. The fabric is the most expensive part of your new furniture and with a little care and attention, will last many years. Direct sunlight can cause fabrics to fade, or discolour and in some cases weaken the fibres so that it wears out prematurely. Protect your fabric by drawing curtains or blinds. Direct heat from heaters, radiators and fires can have the same effect, so position your furniture away from any possible source. Do not allow sharp objects such as jewellery, zips on pockets, buckles, pens, keys etc to come into contact with your furniture. Pets claws can also damage fabrics. These items may cut, or snag the fabric. If snags do occur, do not pull them. Remove carefully with scissors. Pile fabrics such as velvet and chenille may show pressure marks and shade variations to the fabric surface through normal use. This appearance is a characteristic of this type of fabric and does not affect their durability. Vacuuming and brushing the pile in the opposite direction will help to bring them back to their original condition. The colour may vary dependent on the direction of the pile. Pilling or bobbling is a natural characteristic of new natural fibre fabrics and will eventually stop. Soft brushing and vacuuming will help to reduce the appearance, as will the use of a lint remover, or clothes shaver. The frame has been manufactured from seasoned European Birch hardwood. The frame is constructed using water-based adhesives, screws and wooden dowels to ensure that it will not break. Separate corner blocks are used to support the legs, or feet and all spring rails are supported by 15, or 18cm solid wooden blocks. The frame has been manufactured to try and make it as indestructible as possible. They are so strong that in years you may even decide to have it reupholstered. However, arms and backs of sofas have not been designed to be sat on. Sitting on these parts will flatten the upholstery and may weaken the structure. 100% duck feather, 100% fibre (Wellman and Quallofil Fusion) and feather/fibre mix cushions require regular plumping (at least weekly) to help retain their comfort and appearance and to prevent the feathers and fibres binding, which can cause cushions to flatten and lose shape and comfort. To correctly maintain, turn a cushion on to one of its outside edges and beat the opposite side vigorously with the palm of your hand. Repeat for each side, then shake and replace. All cushions, including foam fillings should be turned weekly to prolong the life of both the filling and the fabric cover. Try not to sit on the front edge of seat cushions to avoid premature wear. All furniture with a fixed seat will require regular dressing. Smooth any wrinkles with the palm of your hands by working from the centre of the seat towards each arm and from the centre towards the back of the seat. Continually sitting on undressed seats should be avoided as creases may form and damage the fabric. Furniture must be lifted and not dragged. The most common cause of weakening the joints of any furniture is dragging them across floors. Deep pile carpets create enormous resistance when furniture is dragged, rather than carried into a new position. Wood, laminate and vinyl floors can also be damaged and scratched by dragging furniture across them. Carefully vacuum your furniture with the appropriate upholstery attachment on a weekly basis to remove dust and grit that may harm the fabric. If the seat cushions are removable, you can also clean the seat base. Deal with spillages immediately to stop them absorbing into the fibres of the fabric. Liquids should be blotted with a kitchen towel. Avoid rubbing the stain into the fabric. Food should be allowed to dry and then removed with a spatula. Spot cleaning is not recommended. Domestic cleaning products and household bleaches can damage dyes in the fabric and must not be used. If you are unsure how to clean a product, or if a stain cannot be removed, we recommend that you seek advice from a professional upholstery cleaning company.